See Condos for sale in the Aspen Grove Condominium Development here. HOA Fees: HOA fee for the Aspen Grove Development and HOA fee for the Master Planned Community of Northstar – two HOA fees. At any one given time, the number of Aspen Grove Condos for Sale is limited. 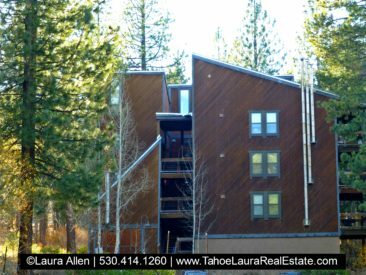 If you don’t find the Tahoe property you are looking for, or want to find condos that are located in the Northstar area call me at 530.414.1260 and I can help you with your Tahoe condo property search. 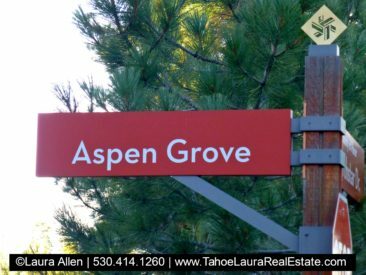 The Aspen Grove Condominium Development is a mountain area complex located in the Northstar ski resort community in Truckee, California. 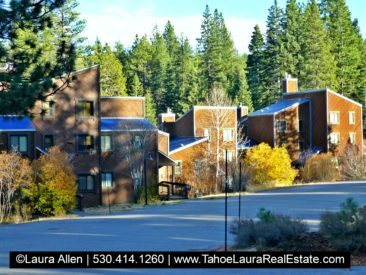 The Aspen Grove Condominium development is located directly below the Village at Northstar (walking distance) and next to the Northstar Property Owners Association (NPOA) recreational amenity area (walking distance) in the Northstar area. You may recognize this condo development because of their metal “blue roofs” that you can see as you drive up to the Village at Northstar. The Aspen Grove Condominium development is sought after because of its very desirable location, affordability on sales entry point into the area, reasonable Home Owner Association (HOA) dues, and area amenities. The Aspen Grove Condominium complex has 180 units, and covers about twenty-one (+/-21) acres of land. The complex was developed in the early 1970’s (1973-1974). This ski resort area development offers a variety of floor plans with studio, one (1), two (2), three (3), and four (4) bedroom layouts. Aspen Grove Condominium development has thirty-six (36) buildings. Most Aspen Grove units have some type of forest, wooded, and/or creek view depending on the location in the complex. Owners in the Aspen Grove condominium development have a mandatory membership in two (2) home owner associations – the Aspen Grove Condominium Association (AGCA), which deals with the oversight and direct management with the owner units, and the Northstar Property Owners Association (NPOA), which provides recreational amenities for home owners in the Northstar area. The selection of units for sale in the Aspen Grove condominium development are limited, so buyers need to be prepared to act quickly if they want to get into this complex. Conveniently located next to the Village at Northstar and the NPOA facilities, along with the close proximity to downtown Kings Beach, downtown Historic Truckee, Lake Tahoe, and the Nevada Stateline, everything the Tahoe area is known for is just a short distance away to hiking trails, public beaches, golf courses, skiing, restaurants, shopping, entertainment, and so much more! 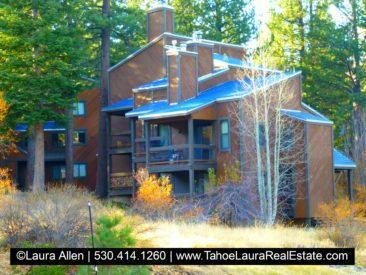 Need help with your Tahoe property search? Call me, I can help you too!